The two Major League Soccer expansion teams that will debut next March will appear first in FIFA 15. Both Orlando City SC and New York City FC are going to be added in a November content update well in advance of the new season. Porsche is returning to Forza Motorsport! Today we’re unveiling the first look at the Forza Motorsport 4 Porsche Expansion Pack, which will arrive on Xbox LIVE on May 22, featuring content and gameplay experiences solely dedicated to one of the world’s most iconic automotive brands. First up, the cars. The Forza Motorsport 4 Porsche Expansion Pack will feature 30 incredible Porsche models for you to collect, drive, and customize, including two models announced today: the 2010 Porsche 911 Sport Classic and the 2010 Porsche Boxster S. Seven of the 30 Porsche models that will be featured in the Porsche Expansion Pack are brand new to the Forza franchise—look for more car details to be revealed in the coming weeks. The Porsche Expansion Pack is more than just cars, however. The pack will also feature 20 brand new Porsche-centric events to be added to your Forza 4 career, as well as 10 new Xbox LIVE Achievements (worth a total of 250 Gamerscore points) all centered around Porsche. 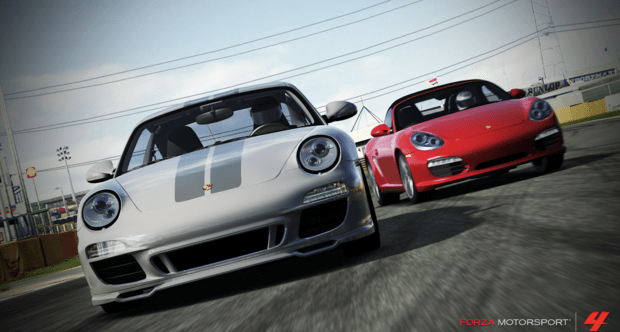 In addition, players can expect to see Porsche models in the AI field when racing in events, as well as integrated into Forza 4’s level reward structure.